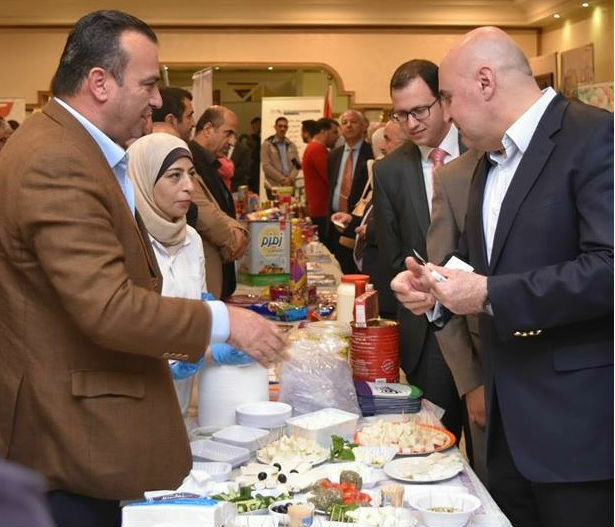 USAID Jordan and the Center for International Private Enterprise partnered with 11 Jordanian business associations to help them be more effective in providing services to their micro and small enterprise members. A USAID LENS/CIPE-supported training workshop for the WAEDAT business association on access to finance, business planning and marketing for women-led micro enterprises. Micro and small enterprises (MSEs) make up the vast majority of private enterprises in the Jordanian economy. They contribute 40 percent of Jordan’s GDP and employ 60-70 percent of workers in the private sector. Encouraging the growth of MSEs is crucial for creating jobs and strengthening Jordanian communities. Private sector business associations provide vital support to MSEs and improve the business environment so that these enterprises can thrive. 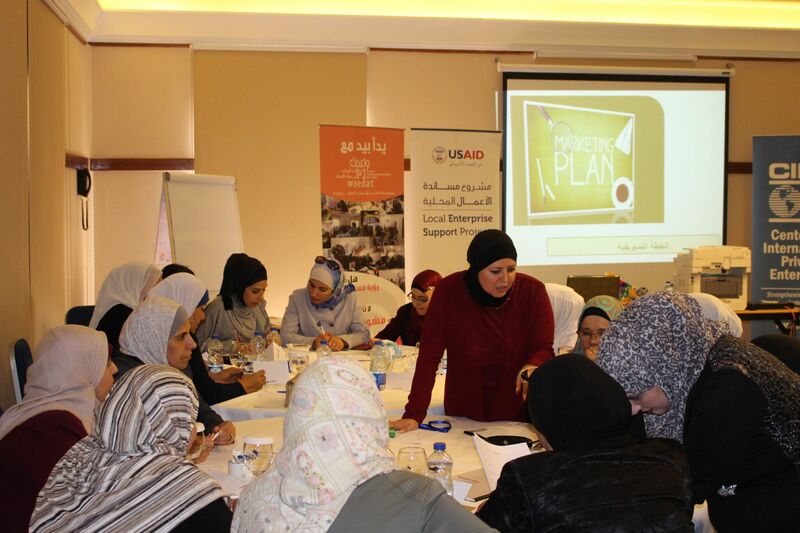 The USAID Jordan Local Enterprise Support Project (LENS), through a grant awarded to the Center for International Private Enterprise (CIPE), has been working with 11 business associations in Jordan since 2016 to help them improve their capacity to provide much needed support to their MSE members. Under the comprehensive technical assistance program developed by CIPE with assistance from USAID LENS, the associations received support through training, mentoring, coaching and consultation. A focus on strategic planning, good governance, financial sustainability, communications and branding, and member outreach helped the associations provide new and enhanced business support services to their members. The 11 associations represent multiple sectors, including manufacturing and logistics, tourism and hospitality, green built environments and renewable energy, and women-led businesses. Association support for MSE members includes training in business skills, such as business planning, marketing, and accessing finance, as well as industry-specific technical training to provide members with information on the most up-to-date practices in their field. For example, a USAID-supported workshop on certification systems for net zero carbon buildings, the first training on this topic in the Middle East and North Africa, provided MSEs in Jordan’s green building sector with information on the most up-to-date tools in their field. Association events, such as EDAMA’s Power Breakfast, provides MSE members with crucial access to the networks they need to achieve business success. Networking events hosted by associations are a particularly important service for MSE members as the events introduce them to potential business partners and investors, contacts they often struggle to access without an association’s help. Association members receive marketing support through association-driven print and online platforms as well as exhibitions hosted by the associations. Left: Minister of State for Investment Affairs, H.E. Muhannad Shehadeh, meets with East Amman Industrial Association (EAIIA) members and views their products at an exhibition held by the association. 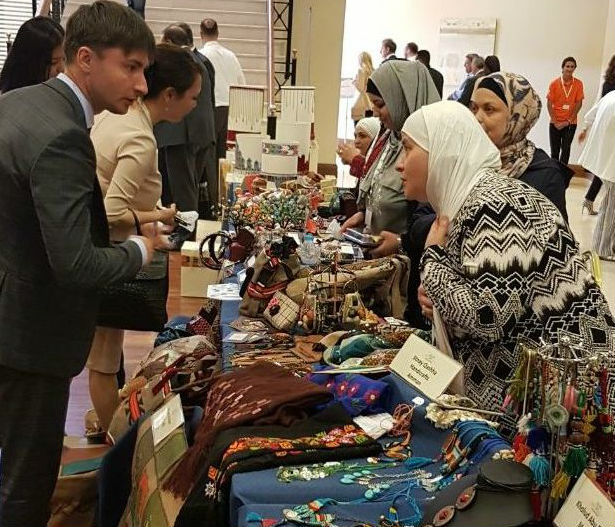 Right: WAEDAT members display their products at an exhibition held on the sidelines of the European Bank for Reconstruction and Development Annual Meeting and Business Forum 2018. Associations are also the voice of their members and play a vital role as the members’ link to government agencies. In addition to the training workshops on advocacy made possible through USAID LENS assistance, CIPE also partnered with the Al Quds Center for Political Studies to help the associations leverage their expertise and contacts to advocate policy and regulatory reforms. Many of the associations were able to employ the strategies and tactics introduced to effectively advocate on behalf of their MSE members. With a view towards long-term sustainability, USAID and the King Abdullah II Center for Excellence (KACE) developed a customized training curriculum to be offered by KACE to all business associations in Jordan, enhancing the overall quality management and support services available to the business support sector. 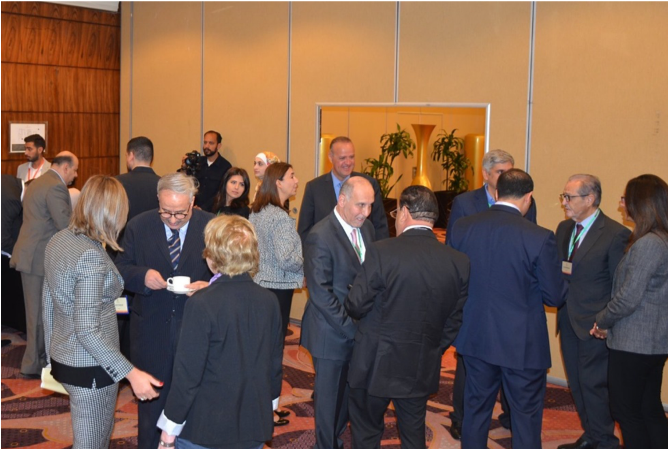 Strong and vibrant associations are transforming the business environment for MSEs in Jordan. Through their partnerships with USAID, the associations are in a better position today than ever before to fuel economic growth for MSEs, increase their competitiveness, and expand opportunity throughout the country.